Michel Cote. 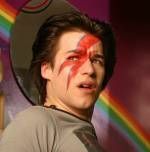 Marc-andre Grondin. Danielle Proulx. Emile Vallee. Pierre-luc Brillant. Maxime Tremblay. Alex Gravel. Natasha Thompson. Johanne Lebrun. Mariloup Wolfe. Comedy. Drama. Religion. Gay Interest. Music. Coming of Age. Art House. Drugs Related. Recommended. 1960s. 1970s. 1980s. 01 Dave B's must sees. 01 Nigel's Choice. Dave T's Platinum Picks. 01 Tara's Midnight Movies. 01 Kelly's Heroes. Rob Recommends. Eight-year-old Zachary has, so far, enjoyed life as his father's favourite son, as the possessor of a gift for healing and as younger sibling to a tearaway, a jock and a bookworm, but this relatively idyllic childhood in Qu�bec is cast under the shadow of his dad's suspicions when he is discovered wearing a dress. Seven years on it's 1975 and Zac is in thrall to Ziggy Stardust and his cousin's boyfriend, a confusing situation for him, made more complicated by a history of trying to satisfy his dad's narrow expectations.This warm, colourful coming-of-age tale benefits from an embarrassment of riches; engaging central turns, iconic music and a fantastic, enjoyably rambling narrative. Its firm grasp of period and plausible sense of family life are complimented by fantastical touches of magical realism and an ability to convey the transcendental power of music, a passion shared by both father and son. C.R.A.Z.Y. is high on this reviewer's list of the best movies of '06. Its themes and styles are far reaching in scope, but its substance is never compromised by its ambition.